This is an intermediate to advanced project and I do not recommend it as a first project if you are just getting started in synths or electronics. Only the circuit and some explanation are shown here. A lot of project building, troubleshooting and electronics experience is assumed. Additionally, electronic equipment ownership (scope, meters, etc.) is taken for granted. If you are interested in building this project please read the entire page before ordering PC boards to ensure that the information provided is thorough enough for you to complete the project successfully. Cornucopia: a symbol of plentitude, strong harvests and abundance. This circuit delivers a plentitude of noise, a veritable harvest of noise, yes, I dare say... an abundance of noise. Noise, noise and more noise. This circuit gives you white noise, pink-ish noise, high pass noise, grainy noise (with grainy adjust), and lastly adjustable random gates. Noise lovers take heart this board was made for you. 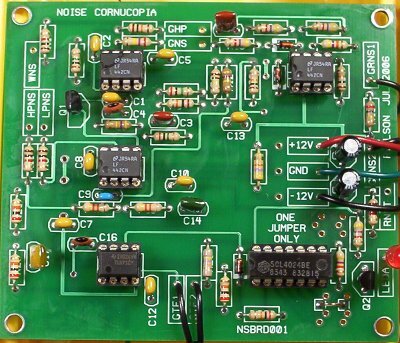 In the Noise Cornucopia, the noise source is the reverse-biased emitter-base junction of Q1. We cut off the collector of Q1 so that it doesn't act like an antenna picking up unwanted noise or EMI. The BVEBO (Emitter-Base Breakdown Voltage) is exceeeded thus the transistor is operating in avalanche mode. More noise info can be found here: Random Electrical Noise: A Literature Survey - by Terry Ritter. The noise generated at the EB junction of Q1 is capacitively coupled to the non-inverting input of U1-A which is biased to ground by R4 (2M) resistor. A gain of 48 is added by U1 and it's output feeds capacitively coupled gain block U1-B which multiplies the total gain to 1296 (48 x 27). The level of noise expected by the rest of the circuitry is approximately +/-5V P-P so if necessary adjust the value of R8 (higher value for more gain, lower value for less gain). I found that just about any 2N3904 provided enough noise for this circuit but you may have to try a few for the best noise. U2-A and associated components comprise a high pass filter which gives the noise a very nice hissing quality. U2-B and associated components comprise a low pass filter which gives the noise a very nice Niagra Falls kind of sound. The plain white noise is provided by the output of U1-B. The plain noise is applied to the inputs of window comparator U3-A/U3-B and associated components, and single sided comparator U4. The window comparator delivers high pulses (approx. -12V to +12V) when the noise exceeds the high window threshold voltage and low pulses (approx. +12V to -12V) when the noise exceeds the low window threshold voltage. The high and low pulses pass thru D1 and D2 respectively and are dropped across resistors R15 and R21 which act as a voltage divider to lower the level of the noise appearing on the Grainy Noise output. At the cathodes of D1 and D2 spikes go from ground to -12 or ground to +12 depending on which side of the window is being exceeded. A passive high pass filter (C15 and R23) is applied to Grainy Noise and not too surprisingly results in the Hi-pass Grainy Noise output. The Graininess adjust works by setting the size of the window for the window comparator. When wide (low setting), fewer noise peaks exceed the high and low voltage thresholds. As the window is narrowed more and more noise peaks exceed the high and low thresholds and thus more and more high and low pulses occur. This causes the noise to go from a few ticks to a full rainstorm/hailstorm/meteor shower... whatever. The noise applied to the single sided comparator U4 is slightly filtered by the passive low pass R26, C17, R27 and applied to the non-inverting input of U4. The threshold for comparator U4 is set by the Gate Frequency pot R28. When noise peaks exceed the threshold set by R28 the output of U4 goes high (from approx. -12 to +12V). The positive excursions are fed through D3 and dropped on R29. These pulses provide a clock to the CD4024 7 stage binary counter. Since the clocks do not occur at a regular frequency the counter's outputs change randomly. The most randomness occurs at the low Qs with less randomness at higher Qs. This is because higher counts begin to average the time between pulses so while they will still have a random element they will seem more regular. The board provides jumpers for you to choose which CD4024 output you want to use. You can temprarily jump the outputs to the junction of R30/R32 to see which output suits your random gate tastes or just choose the one I did (Q5) and insert the jumper in the space indicated by the parts legend. Q2 drives the Gate indicator LED to indicate the presence of gate high. Assume slightly more current at +/-15V. I find this view useful when I'm populating the board. I don't have to go back and forth from the designator to the value. It speeds up construction. Click the "Larger GIF" link and print the image as landscape. Using 1% metal film resistors everywhere will reduce temperature related drift. Where 1% metal film is specified 5% carbon comp will work but with more temperature drift. Usually biFET amps (quads, duals, singles) can be replaced with an equivalent from another manufacturer. Capacitors can be film, ceramic, or silver mica. LM13700 subs (if applicable) (LM13600, NE5517, AU5517, NTE870). 1/16" Thick aluminum plate for mounting the pots and switches. Unit is typically mounted in a synth case with other synth modules. Knobs for potentiometers, wire and solder. Digital Volt Meter and a Signal Tracer or oscilloscope for testing.